In partnership with Rosetta Stone, Getting Smart – a community passionate about innovations in learning – released the infographic, Elevate and Empower: World Language Instructors as Key Players in the Shift to Competency-Based, Blended Learning. This infographic provides an overview of an upcoming paper by Tom Vander Ark, Carri Schneider, Moss Pike and Winifred Kehl, and outlines the project’s goals and findings. Included in the infographic are quotes from people the authors surveyed, trends in evolution, and more. Check out this clip from the infographic which features data from Speak Up 2013! Check out Getting Smart’s full inforgraphic on their website! Be on the lookout for their upcoming paper, which will be released in conjunction with the team’s session at the iNACOL Blended & Online Learning Symposium in November. Getting Smart® is a community passionate about innovations in learning. They believe the shift to personal digital learning holds promise for improved student achievement in the developed world and access to quality education in the emerging economy. They are advocates for better K-12 education as well as early, post-secondary and informal learning opportunities for all students. They attempt to accelerate and improve the shift to digital learning. They cover important events, trends, products, books, and reports. Getting Smart welcomes guest bloggers with something to say. They look for ways that innovation can help reframe historical problems and suggest new solutions. This entry was posted in Speak Up and tagged Getting Smart, iNACOL, Rosetta Stone, Speak Up, Speak Up 2013, World Language teachers on October 28, 2014 by Lisa Chu. This year we’ve added more questions about Bring Your Own Device (BYOD), data privacy, student interest in programming and computing, and online assessments. What will this year’s results be? Contribute to the conversation by participating in Speak Up 2014! Speak Up provides an easy way for students, parents and educators to participate in local decisions about technology, as well as contribute to the state and national dialogue about educational technology. Data from the surveys – including data regarding online classes – will be released in February 2015. Click here to register for Speak Up 2014, and be sure to take the survey before it closes on December 19th, 2014! This entry was posted in Speak Up and tagged Flashback Friday, Speak Up 2013, speak up 2014 on October 10, 2014 by project_tomorrow. Over two hundred schools and districts across the country were recognized for incorporating feedback from their students, educators, parents, and community as they develop strategic plans, make budgeting decisions, enhance their curriculum and determine professional development needs. Project Tomorrow®, a national education nonprofit, announced this year’s Speak Up Loud and Clear schools, a collection of the top K-12 schools that encourage and involve authentic student, parent, and educator ideas and views in education planning and decision-making. The schools were selected for this national distinction from over 30,000 schools nationwide that participated in the annual Speak Up surveys, collected by Project Tomorrow since 2003, in 2013. The Speak Up National Research Project collects K-12 student, parent and educator viewpoints on technology usage and 21st century aspirations through an annual online survey process, and shares that data with national, state, and local policymakers to improve education for all children. The schools selected for Speak Up Loud and Clear represent a broad range of educational institutions in rural, suburban, and urban communities. The complete list of Speak Up Loud and Clear recognized schools are highlighted on the Project Tomorrow website at http://www.tomorrow.org/speakup/speakup-loud-clear.html. Project Tomorrow will promote this year’s Speak Up Loud and Clear schools’ distinction to the Congressional representative and state Governor of each Speak Up Loud and Clear school to demonstrate the power of educational innovation at the local level. 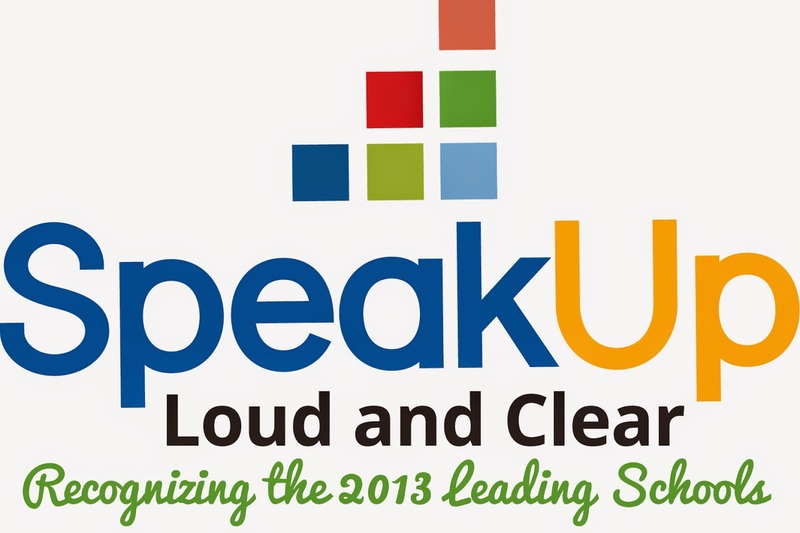 The schools will also receive a unique Speak Up Loud and Clear logo to include on their school and district websites. Project Tomorrow has tapped into the expertise of this year’s Speak Up Loud and Clear schools to develop new questions for Speak Up 2014 which is open from October 6th through December 19th, 2014 for student, educator, parent input and more at http://www.tomorrow.org/speakup/. Additionally, their success stories are being shared with our partners and national policy organizations to inform national and regional education reform efforts. This entry was posted in Speak Up and tagged Speak Up 2013, Speak Up Loud and Clear on October 9, 2014 by project_tomorrow. Join Julie Evans tomorrow for her free keynote session during the Reinventing the Classroom conference: “How Ed Tech Is Reshaping the Classroom Experience.” This is a free event bringing together classroom educators and innovators around the world. The entire conference takes place in a webinar format, and specifically encourages teachers to share their best practices with their peers. Keynote information: The dynamic profusion of emerging technologies, both in school and out of school, is propelling today’s K-12 students to make new demands on their schools for a dramatically different kind of educational experience. Enabled, empowered and engaged, our students have a unique vision for 21st century education that reflects their desires for social-based learning experiences that are un-tethered to the traditional classroom and rich in digital media and content. The annual Speak Up National Research Project provides an exclusive window into the views of students on 21st century learning and technology. In this session we will share the latest Speak Up national findings from over 403,000 K-12 students, parents and educators with a special emphasis on the how today’s students want to be engaged with mobile learning, online and blended learning, and e-textbooks and digital content. The session will provide new insights into the digital disconnect between students and educators and stimulate conversations about how to effectively leverage emerging technologies to drive both increased student achievement and teacher productivity by re-inventing the classroom. Don’t forget to log in to http://bit.ly/1n05N5Z at 6PM PT tomorrow. Be sure to use the hashtag #reinvent14 and mention @SpeakUpEd, @ProjectTomorrow, and/or @Julie_EvansPT if you are taking the conversation to Twitter! This entry was posted in Speak Up and tagged Speak Up 2013 on April 30, 2014 by project_tomorrow. Speak Up 2013 is now closed for input. Thank you to everyone who participated in this year’s survey! Welcome back parents, educators, administrators, and students! We hope you all had a great winter break. This year 403,292 Students, Parents, Educators and members of the community representing over 8,000 schools nationwide participated in Speak Up. Thank you to everyone that participated for supporting the mission of Project Tomorrow to ensure that every student has access to innovative learning opportunities. Learn more about the great promotions and happenings that took place during “Speak Up America 2013”, please click here. Again, thank you for your support in making this year’s survey a success! We look forward to your participation in Speak Up 2014. This entry was posted in Speak Up and tagged Speak Up 2013, Speak Up Snapshot on January 6, 2014 by Project Tomorrow. Donate 15 minutes of your time today for the future of education! Have a voice, participate in National Speak Up Day today December 18, 2013! Join the conversation about the use of technology for learning through Speak Up, a National Research Project. Since 2003, over 3.3 million K-12 education stakeholders have participated in the annual online surveys. Data findings are shared each year with federal, state and local policymakers to inform education programs, policies and funding. More than 366,000 K-12 students, parents, educators and members of the community have already completed Speak Up surveys, this year, from all across the country. But now it is your time – Speak Up, America! Have a voice in the future of digital learning in our nation’s schools by participating in this year’s special Speak Up America campaign. To “Speak Up,” simply visit www.speakup4schools.org/speakup2013 to take the online survey by Dec. 20th! 366,090 (and counting!) overall surveys taken. Surveys taken this week 51,326 (and counting!). Click each audience to view the 2013 preliminary data infographic for that group, or to view them all go to:http://www.tomorrow.org/speakup/speakupamerica_snapshot.html! Thank you for your interest and continued support of Speak Up! We look forward to your participation in Speak Up 2013! Be sure to stay updated on all things Speak Up by following us on Facebook, Twitter, Instagram, Pinterest and ourBlog. This entry was posted in Speak Up and tagged Speak Up 2013, Speak Up Snapshot on December 18, 2013 by Project Tomorrow. Educators, have your students participate in Speak Up for a chance to win a $500 grant for your classroom or school! We are very sensitive to student and participants’ privacy and with that no faces are required to be in the photo. We just ask that you incorporate our special Speak Up America badge into a photo of your classroom or school, the more creative the better! · There must be record of survey completion in our system i.e. surveys taken at your school. · At least 25 submissions must be present for daily selection to occur, be sure to encourage others to participate. Check back later to see today for the announcement of Monday’s Photo Challenge winner! This entry was posted in Speak Up and tagged Speak Up 2013 on December 17, 2013 by Project Tomorrow.